Stories that need to be told, show announcements, special vehicles, our website developments, and all else we see an interest in. Let us know your thoughts and reactions! Jags Are The Featured Mark In Norcross - Sept 8 -Saturday! The 2018 Atlanta British Car Fayre will feature over 400 distinctive British Automobiles and Motorcycles. 10 AM to 3 PM in Historic Downtown Norcross, GA. This year’s featured marque is Jaguar. FREE to the public, FREE Parking and Shuttle Service. Includes the Car Show with Best of Show Award for autos & motorcycles, Car Boot Sale, Raffle Awards and MORE! Please go to our website for more info and to register early! Our charity is again The Amanda Riley Foundation, which aids children with cancer. Speakeasy Club Track Day Event at Atlanta Motor Sports Park on May 19, 2017. I was recently asked to join the Speakeasy club at one of my favorite places for fun, the Atlanta Motorsports Track located at 20 Duck Thurmond Road in Dawsonville Georgia. The Atlanta Motorsports Park is home to two driving circuits in the North Georgia Mountains. Designed by Formula One architect Herman Tilke. Inside of the main course there is the Go Kart courses, which has three different configurations. However, today the Speakeasy Counter Culture Club was there to experience the main course for cars, a two-mile main road course was recently voted one of the Top 10 Tracks in North America by Road & Track Magazine. The author having driven it can also attest, it is a track with elevation changes and a very technical layout, making it a challenging course designed to make sure the driver can develop the skills necessary to complete the course in the best possible time for car and driver. 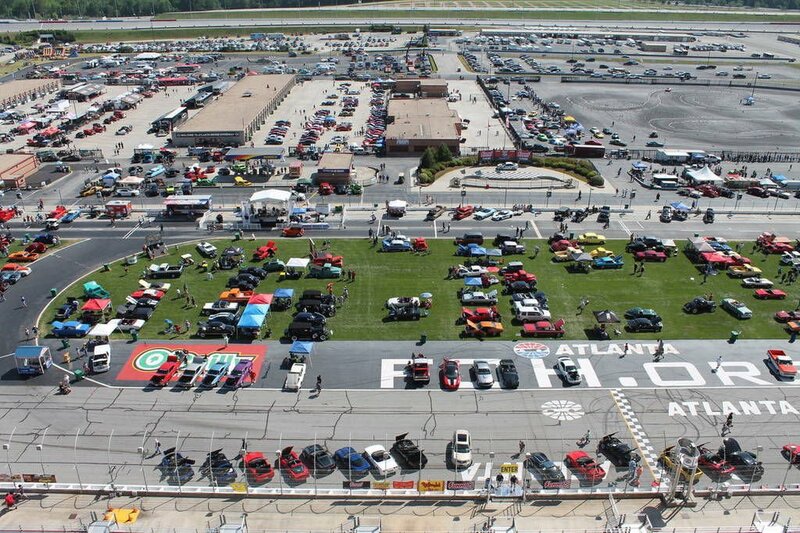 Atlanta Motor Speedway to be featured on ‘Lokar Car Show’ this weekend - Courtesy of the Henry Harald. HAMPTON — Atlanta Motor Speedway and the Summit Racing Equipment Atlanta Motorama will hit television screens nationwide this weekend as the featured location on Episode three in Season 5 of the “Lokar Car Show” on the Velocity channel. The first airing of the show will begin at 9 a.m. EDT on Saturday, July 15. The episode will air again on the same channel the following day, July 16 at 8 a.m. and will also air three times during the 2017 season on both the MAVTV and REV’N networks.